Avila's Pro Shop has developed a group of saddles that will satisfy the most discriminating customer. From the nationally marketed Bob's Custom Saddles to the individually bench made Cowhorse Horse Equipment show saddles, we have our customers' needs covered. 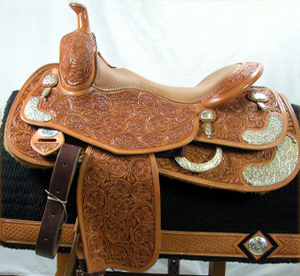 Bob's Custom Saddles are the best production saddles to be found in the U. S. They are a very popular nationally known saddle company. Cowhorse Equipment saddles are made exclusively for Avila's Pro Shop. They hand made by one saddle maker from start to finish.